Hey, everybody I am working on a terraria/starbound-like game called Cave Combat. Mainly I introduce my game here to look for some facebook followers, so that this game have some more people who see the news. So if you like Terraria or Starbound or just fighting in a random generated world please follow this game on facebook. First off, to see the full development, check out Facebook. I've started this game a while ago in Java. As an avid Terraria fan I decided to make a game pretty much in the same setting focused on fighting each other in different modes: Simple, Co-Op, Team etc. At the beginning you and the other players start in the surface of the world and then go deeper and deeper, improving your armor, learning new abilities and fighting bosses until just one player or team survives. Does anyone have this guy's movement animation? I need it for our game. That creature requested the person to come closer because the creature wanted to tell he something. Here we go! This is my Zelda fangame: The Legend of Zelda: Time Walker. I have been working on this project since 2010, but until 2011 I worked with the RPG Maker 2000. Now (since 2011) I am working with the Game Maker. This Technical demo includes a zelda dungeon to explore with a lot of monsters and puzzles. Note: This Website is currently only a german website. Note: This Screenshots are currently in German, in the technical demo you can choose your language. The Titlescreen - You can see it in German and in English, additionally it is different if it is day or night. 1)The Menuscreen, which (hopefully) contains all items on the technical demo. 2)And the first screen: Here you can see the place before the dungeon. 1)As you see you have to be carefully in the dungeon. 2)The dungeon contains a lot of areas. Test your intelligens! Note: Not all Features will available at the release. Therefore, I will update the technical demo after the first release. Oh, and there are secret features too, which you can see after the release. - I killed the "Shield Killerbug"! Now you always die correctly. - All soundfiles will be import now! - Now you can restart the game without set the language automatically in "German". - Now you can open the door in the dark room and explore the full technical demo!!! - "Secret" room has not the same music as the outside field. Sahittam - Awesome MC engine, dude! 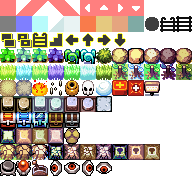 xfixium - Thank you for your tilesets and sprites! Moffett - Thank you for a lot of sprites! Hello I have a problem with the background transparency. My question is: How I can make the background of a map transparensy. The Problem is: I don't want to draw the full background. I only want to draw the Tiles of the map. At next I will draw the second background(I mean the tiles of the map) with other colors. Therefore I have two background for tiles. But I don't know how to draw the tiles with two different backgrounds and with transparensy. Hello I want to make a Day/Night Background like King Mobs one. But I don't know if it is correct to use the same colors like King Mob. The other problem is nobody can't get in touch with King Mob and I can't ask himself. The question is: How I can make my minimap better? Hello again, now I have a new problem! I can't hear the first looping sound. Only the second sound is looping. Hello, now I have another problem. I have two objects. [Object 1] and [Object 2]. [Object 1] is an enemy, that can't move. But the enemy can spit cores. [Object 2] is Link. He can move. Now the enemy should split cores to Link. But this is every time different, therefore I need help with this code. How do you would build this code? Okay, I am working on a moldorm script. My problem are the objects, that (follow) the head of the moldorm. These objects should repeat all what the moldorm head does. I am trying to make a Leever but I have an error in my code. If there isn't a collision the AI_stage should change to AI_stage 1. But sometimes there is a collision and the AI_stage is AI_stage 1. EDIT: AI_STAGE 1 IS IN THE CODE! Ã–hm... next problem, next question. If the object collides with a Boomerang then it creates stars above the object. Now I have a second object in the map with the features of the first object. And the second object creates the stars above the first object and not above itself. How I can stop this? How I can test Link's x-coordinate and y-coordinate change while moving? Audio / Which MP3 is legal for a Zelda Fangame? Many Fangames have MP3's, but I want to ask which MP3 is legal for a Zelda Fangame. Hello, I think it is better when I post all my current sprites in one thread. Edit: If you want to use this sprites don't use the safari icon, because it is from Apple.